Sonivox announce February sales ! 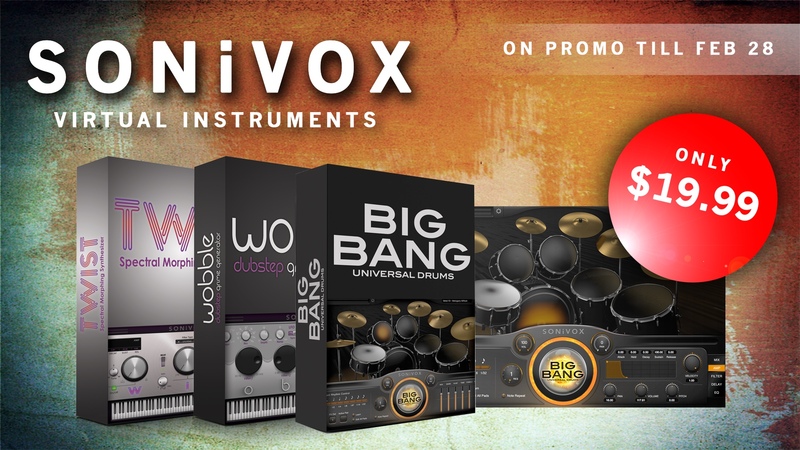 Sonivox have annouced February sales, a special promo treat on 3 of their classic and best seller virtual instruments. Staring Feb 1st and ending, Feb 28th. Read more at the product page here. Experience audio vertigo-go with the swaying, shifting, tones of Wobble 2—the Dubstep Grime Generator from SONiVOX. This highly expressive instrument revolves around two channels of our exclusive Spectral Morphing Synthesis engine. Each channel features independent harmonic controls, individual filtering, and discrete LFO controls—including tempo-sync. Wobble 2 keeps things moving with an advanced pattern generator and onboard effects. This unparalleled combination delivers the swirling and undulating big-time grime that is the essence of Wobble 2. Even with all this control, the onscreen interface is clean and uncluttered; the well-defined controls deliver incredible sound-sculpting abilities, while providing immediate audio results. Wrap yourself around Twist 2—the Spectral Morphing Synthesis instrument from SONiVOX. Combining a dynamic interface, an advanced pattern generator, and onboard effects, Twist 2 is your toolkit for serious sound design using simple, time-saving controls. Two swirling sound layers provide unique harmonic controls, forming the foundation for every patch. Common elements include a monstrous multi-mode filter, independent Amp and Filter envelope generators, plus a remarkable LFO that can be sync’d to the current tempo. The onscreen interface is clean and uncluttered; the well-defined controls deliver incredible sound-sculpting abilities, while providing immediate audio results. Sonivox products are available here at the DontCrack Store. This entry was posted in DontCrack, Promotions, Virtual Instruments and tagged Big Bang Universal Drums, Drums, Dubstep, Grime, Lead, LFO, SONiVOX, Synth, Sysnthesis, Twist, Wobble. Bookmark the permalink.